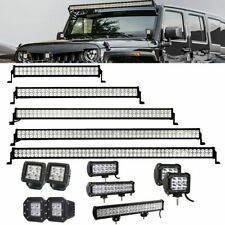 23Inch LED Light Bar Combo + 4" CREE PODS OFFROAD SUV 4WD Ford Jeep UTV 24/22"
20inch LED Light Bar Combo+2x 4" Cube Pods For Ford Offroad 4WD Jeep SUV 22" 19"
52Inch LED Light Bar Combo+ 20" +4" CREE PODS OFFROAD SUV 4WD ATV FORD GMC 50"
52Inch Straight LED Light Bar + CREE 4" PODS OFFROAD SUV 4WD FORD JEEP 50"
New listing 42Inch LED Offroad Light Bar Combo + 20" +4" PODS SUV 4WD UTE For FORD JEEP 40"
New listing 20inch LED Light Bar Combo + CREE 2x 4" Spot Pods For Ford SUV 4WD Jeep UTE 24"
32inch 30" Combo Led Light Bar + 22inch +18W 4" Spot Pods Offroad SUV 4X4WD 20"
CREE 52inch 1200W Led Light Bar Combo +4x 4" Cree Pods For Jeep Offroad SUV 54"
52Inch LED Light Bar Combo + 20" + 4" CREE PODS OFFROAD SUV 4WD FORD 22/32"
52Inch Straight LED Light Bar Combo Offroad Driving SUV 4WD Fog Ford 50"
50Inch +22inch Curved LED Light Bar + 4" Pods Offroad SUV ATV For Ford Jeep 52"
This page was last updated: 22-Apr 06:12. Number of bids and bid amounts may be slightly out of date. See each listing for international shipping options and costs.